David A. Bainbridge is professor emeritus of ecology and agro-ecology at Alliant International University in San Diego, California. He is the author or co-author of many books, including The Straw Bale House (Chelsea Green, 1994), A Guide for Desert and Dryland Restoration (Island Press, 2007), and Passive Solar Architecture (Chelsea Green, 2011). He lives in San Diego and has been researching dryland restoration and irrigation since 1981. The title says it all. David Bainbridge has been researching, using and trialling super-efficient irrigation systems based on simple ancient techniques for over 30 years, ever since he read about the use of buried clay pot irrigation in China over 2000 years ago. He has used the systems in all scenarios, from gardens to desert restoration projects, with impressive results. He is a man with a passion for the wise use of water as it becomes a limited resource in the world today. 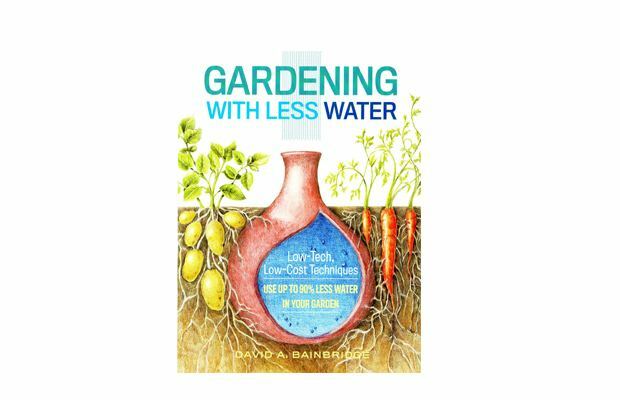 This book is both an instruction manual and an inspiration for using the various systems in any and every situation to reduce water usage and increase plant survival and performance. The book is in two halves. Part 1 examines Super-Efficient Irrigation Systems, with a chapter on each type: buried clay pots, porous capsules, deep pipes, wicks, porous hose, buried clay pipe and tree shelters. The use of each system is explained, how and when it could best be used and its benefits, such as increased yield with low water use and few surface weeds. Clear step-by-step instructions are given, with materials and tools needed. Some of the methods, such as buried clay pots and porous capsules, are very low tech and easy to install and use, especially as Bainbridge suggests how to substitute everyday materials, such as clay flower pots and their saucers, plastic tubing, rubber stoppers and plastic bottles, where the manufactured materials are not available. The most high-tech method requiring the most equipment is probably drip irrigation, which is also the most well known. The results Bainbridge quotes for the different techniques are impressive. In a test in the California desert, all trees on buried clay pots were alive and healthy after eight months, whereas all the trees receiving the same amount of water with conventional basin irrigation had died. The yield of melons using buried clay pot irrigation in India was almost 20 times higher per gallon of water than using flood irrigation in California. A 1910 experiment found that, with porous capsules, a coleus plant could survive for six months on 1.6 gallons (6 litres) of water. And with subterranean irrigation there are virtually no weeds in summer. In Part 2 – Taking It to the Next Level – Bainbridge looks at how you can plan to get the most out of the super-efficient systems you choose. “Water-wise Gardening Tips” has eight tips, the first three of which are music to the ears of MGAP members: give priority to the native gardening plants of your region, choose varieties that are dryland adapted and replace your lawn. All the tips are expanded with useful advice and information. “Rainwater Harvesting” explains how to capture rainwater at home and how to calculate the amount you need and will get, and therefore what size tank you will need. “Landscaping for Water Catchment” would be useful for those with a large area to landscape. 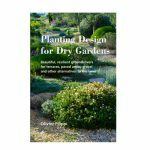 The chapter looks at microcatchments, ridges and basins, swales and collection ditches, soil pits, vertical mulching, check dams, terracing and grid gardens, all illustrated and explained. “Developing a Plan for Your Patio, Garden, Home, or Farm” takes you through what you need to consider when developing a plan for your area and shows sample plans for different situations, combining the different super-efficient systems. The plan of a working farm serves as an example. Finally, “Our Water Future” is a call to action, suggesting how we can help improve water usage more generally, starting with our home garden and then working with our neighbourhood, local schools and colleges, our town and the wider world. The book is a handy size for carrying around to use as a reference: 15cms x 20cms and 128 pages. It is well illustrated with diagrams, charts and photos and the page numbers and chapter titles are in the centre margin of each page, making it easy to navigate. And there is an Index. As this book was written by an American initially for an American audience, most of the references to places, institutions and material sources are American and measurements are US Imperial, i.e. inches and US quarts and gallons. This should not be a problem, though: local material sources are well known, and the measurements should be easy to convert or adapt. This book is full of information, tips and advice, and everyone should find something useful or interesting in it, whether being reminded of things we know and should be doing, or being introduced to techniques that we can use on a small or large scale, or being galvanised to encourage efficient water usage in the wider community.